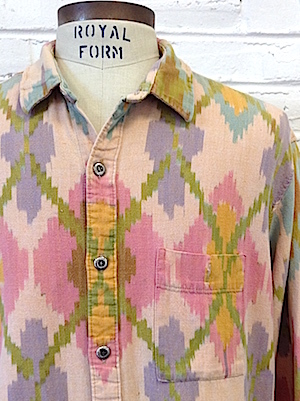 Home > Items just added 4/3-4/17 > (XL) Mens Vintage Southwestern/Navajo Shirt! Dusty Pink w/ Yellow, Blue Green Diamonds! Mens vintage Southwestern/Navajo Shirt! 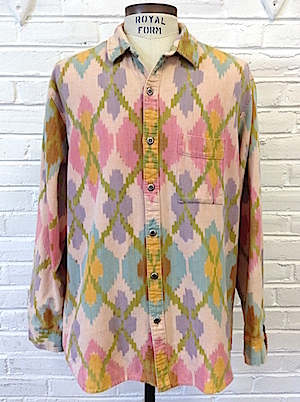 This amazingly cool southwestern shirt has a soft dusty rose base with a pattern made of green, yellow, lavender, sienna and pink navajo/southwestern style diamond shapes. Pattern runs front, Back and Sleeves. Closes in the front with silver colored starburst shaped buttons with two more on each cuff. Patch pocket on the left side of the chest Shirt has a straight hem. Tagged by Native American Tradition by Allen Wah. Feels like 100% Cotton or a cotton blend. Condition: Very Good. Has a small yellow-ish stain on the upper back of the shirt. Does not detract from the awesomeness of this shirt. Sleeves: 33" Collar to Cuff / 26" Shoulder Seam to Cuff Length: 31"